Did you know installing a genuine slate roof using the SlateTec® installation system can actually be more cost effective than a cedar shake installation or re-roof? With StateTec, the usual concerns about roof weight are no longer an issue because the roof can be installed at under 6 lbs/sq ft. — using genuine Greenstone Vermont S-1 slate! There is no denying the elegance and durability of a natural slate roof, however, many consider a natural slate roof to be too expensive to install. When you consider the overall cost of ownership, a strong case can be made for slate due to its 75-year minimum life expectancy. With today’s advancements in the slate roof installation process, slate can be more cost effective than cedar at the time of installation. So, if you agree (as of course we do) that slate makes a better presentation from an aesthetic standpoint we have a clear winner when SlateTec makes a slate roof so much more affordable (and installable) on virtually any home, business, or public building. The SlateTec system will reduce roof weight roughly 40% because it requires less slate—which is also the key to its cost effectiveness. The reduction of roof weight (less than six pounds per square foot) also lowers structural costs either for new construction or renovation, contributing further to the system’s high value. And now, since the Canadian request to exclude the 20.83% tariff on soft wood products has been rejected this new factor in cost has to be considered, at least for the time being. 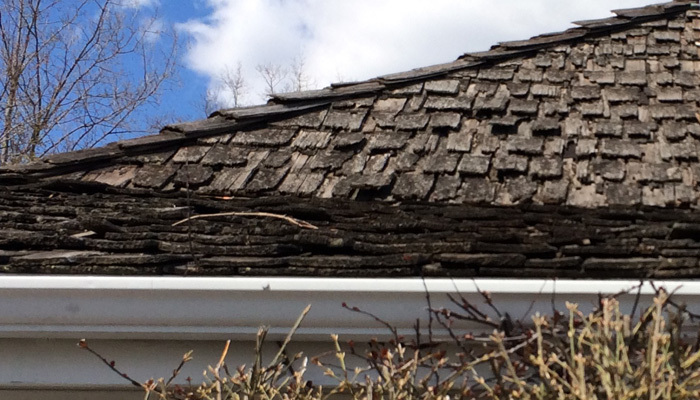 Either way, Slate now deserves serious consideration when a cedar shake roof or re-roof is being contemplated. Warranty Greenstone Slate provides a 100-year slate warranty. SlateTec also provides a 100-year warranty. Cedar Shake manufacturers offer their own independent limited warranties and the coverage length is determined by the manufacturer. Fire resistance Slate is 100% fireproof naturally. The SlateTec system passes ASTM E-108: Class A with their fire retardant underlayment and has passed all non-combustible deck tests. Both Class C and Class B treatments are available for Cedar Shakes. The Cedar Shake and Shingle Bureau* does not support, endorse or promote topical fire retardant treatments. Water absorption Greenstone Vermont slates absorb less than .0025% of their weight when submerged for 72 hours, giving them the prestigious ASTM S1 classification, the highest rating available. Cedar shakes absorb water and without proper sunlight they are susceptible to mold and mildew and rot. Stone is impervious to fungi and mold. Cedar roofs are prone to mold, moss and algae buildup. Environmental impact When it is time to dispose of it, there are no environmental concerns about placing the stone back in the ground. Slate is frequently re-used on another roof, mixed into road pavement or as the pavement itself — from driveways to highways. Cedar shake roofs often end up in the landfill, as they can’t be reused on roofs. However, some contractors promote using them as wood chips or art projects. Maintenance A slate roof needs little general maintenance. High maintenance: Cedar needs to breathe. Leaves and branches must be cleared from roof to prevent moisture damage. Ice dams can also cause water damage and if not repaired in a timely manner additional damage will occur. Reapplying preservation treatments. Repairs Occasionally, individual slates are damaged. The individual slate can be repaired without having to repair the entire row. View the SlateTec repair video (Part 7 of the SlateTec installation video series). When a shake is damaged, sometimes the entire row needs to be replaced for proper performance of the roof. Installation A slate roof installed using the SlateTec installation system can be installed by any professional roofing contractor. View the SlateTec installation videos for more details. A cedar shake roof can be installed by any professional roofing contractor. *Cedar Shake and Shingle Bureau is a non-profit trade association that promotes the use of cedar roofing and sidewall products. To discuss this article or for more information about Greenstone Slate or the SlateTec slate roof installation system, call 800.619.4333 or contact us here.